If you are not 100% satisfied, please feel free to contact us. We provide 1 year warranty and we will try our best to satisfy you. Rested assured to buy! 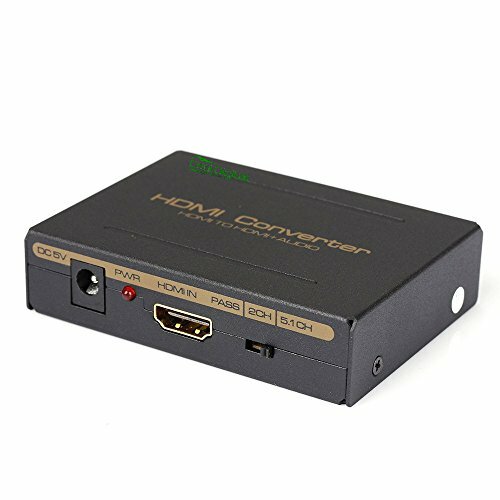 2CH Mode: Extract the digital 2CH PCM stereo audio signal from the HDMI input and convert it to 2CH analog stereo output through its RCA style L/R analog output and SPDIF output and HDMI output at the same time. Suitable for various HDMI source devices like Roku or Chromecast without dedicated audio output as well as Blu-ray/ DVD/ HD player, cable/satellite box, Amazon Fire TV, Apple TV, PS3/PS4, Xbox, PC/laptop, HD camera, HD DVR etc. Supports 24 bit /deep color 30bit, 36bit per channel (36bit all channel) deep color; Supports HDCP, Video EDID Pass Through, Audio EDID Settings: Pass, 2CH and 5.1CH.Does not support ARC. If you have any questions about this product by CoolDigital, contact us by completing and submitting the form below. If you are looking for a specif part number, please include it with your message.